Before creating her own agency three years ago, Charlotte Chipperfield spent almost a decade working in the wine industry. Starting off with a harvest internship, her love of writing and talking about wine led to her moving into the hospitality side. That was before she then went into marketing, where she worked with large international wine brands on the social media, email marketing, and other digital initiatives. At college, she studied international business, and with her obsession of food and wine culture thought she’d end up owning a restaurant. But wine distracted her. The dream of starting her own business still stuck, with the freedom and flexibility appealing to her. And with a love of social media blossoming, marrying together business strategy and creativity, it was only a matter of time. Having founded Chipperfield Media, it has all come together. Based in the San Francisco Bay area, Charlotte is a social media expert with more than seven years of experience in marketing. And she helps you to take your social media strategy back to basics in order to drive customer engagement and to achieve your marketing goals. When Charlotte first started her agency, it was a part-time venture. Her blog had begun to develop into her helping small wineries with their marketing, and that is when it started to come together. With people coming to her asking for her help, she could take the leap and go off by herself full-time. Although terrifying, it was worth it and she looks back now grateful that she found the courage to give it a go. At the beginning, she was on her own, and although those early days were scary, they were also exciting. She found herself wearing different hats she never anticipated wearing, and could go from bookkeeping to creating and implementing strategies for clients. Just like many other entrepreneurs, she didn’t know what problems she would encounter but always found a solution. Starting out with a few clients, Chipperfield Media has grown over the past three years to now producing a lot more content as well as offering training. With her clients, she takes their social media back to basics. There are often lots of trends and things changing regularly, but at the core of it with content planning and strategy, there are a lot of best practices and pillars to go back to. You have to ensure your content is providing value, and giving away what your audience are craving from you. When going back to focusing on the community and content, you will see better results. 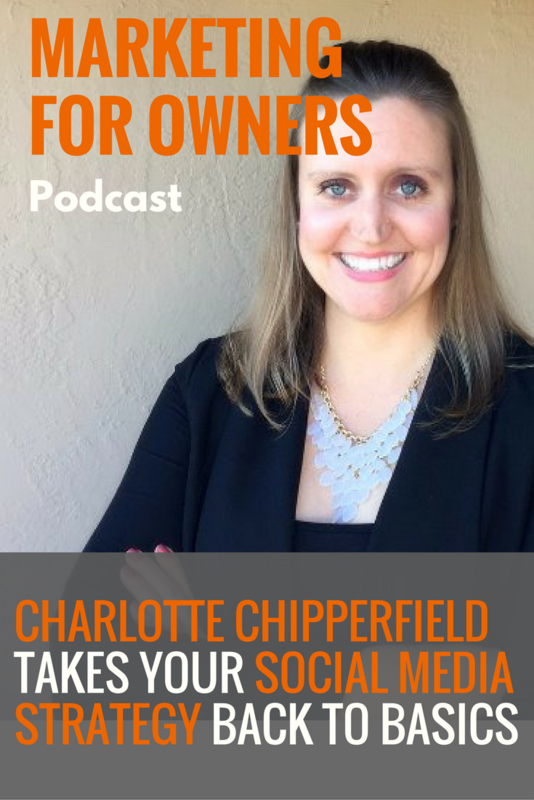 When Chipperfield Media was first started, they were doing the social media management for their clients, creating content calendars and evaluating what works and what doesn’t. They now also help clients to learn the process for themselves. There is real power in a business owning their social media output to make it really authentic, so they approach it more as a partnership. When beginning work with a new client, they may well manage their social media for them, but will then start to help them understand the process and workflow for themselves. Even though it may look like they’re putting themselves out of a job, it is becoming essential to be effective. With live video becoming the big new ‘thing’, it isn’t something which can be done for you from afar. Plus, no-one knows your business and industry like you, and no-one else is better positioned to show followers those behind-the-scenes moments. It is important to remind yourself that everyone starts from zero, unless they’re buying followers. And when you react to social media changes, you can’t expect to see results instantly. Instead, it is a matter of time. Social media is a long game, which involves building a community and relationships over time, to create an engaged following of people who really value what you say. It takes time and is frustrating, but by staying consistent and continuing to offer value, you will grow your following and attract people in need of your message. When you use social media personally, it is very much ‘in the moment’ and posts are spontaneous without goals. With business use, you have to dive deeper into creating goals behind everything you publish. Different posts will have different KPIs which you’ll measure for success. By having various goals, you’ll then be able to create different types of content to achieve them to offer variety. It could be to increase brand awareness, to become a thought leader, or to create sales. You need to then look for the content which will help support the goals. Just make sure you’re not constantly pushing sales and offers, and are also providing people with a solution to their problems as well as connecting with them. It’s good to have an overall goal for what you achieve with social media. To make that manageable, you then need to break it down into quarterly goals, perhaps with a different focus for each. That can then further help you to come up with new themes month-by-month and to help you decide what to post each week. On social media, storytelling is what a lot of followers actually connect with. They don’t necessarily want to know about your products and services, but instead what is behind your ‘Why’. Social media leaves us exposed to each other, and audiences are very tuned in to recognize when people are trying to sell to them, versus building a relationship. It is a two-way street. Telling a story involves going beyond just the one post. The story could last over a week, or even longer, and will have a beginning, middle, and end. As an example, harvest time is an ideal opportunity for a winery to tell their story and it lasts a few months. Over that time, followers can see the whole process which goes into making wine and gives them something they otherwise wouldn’t have seen. So look at your business and understand where you can tell these stories for yourself. It could be the production of a product or the experience your customers can expect. It may well be something you see every day, but for your customers will be a unique experience they’ve not had before. So put yourself in their shoes, and see what you do through fresh eyes, and it can sometimes be worthwhile getting an outsider to help you identify these tales. Everyone has at least one story to tell and highlight. And you can then use it again to share with new followers in the future, by repurposing it to make it look different. When deciding on which platforms to be on, you should think about where you’ll be most comfortable. Of course, you also need to consider who your audience are and where they are, but you must speak to your strengths and not just to your audience. If you’ve got lots of visuals to utilize, then Instagram is ideal. Or if you’re creating multiple blog posts in a week, then Facebook may be best. On the other hand, if your target audience is under 18, then you have to consider Snapchat as well, particularly if you can create videos. Through it all, Facebook remains the staple of social media, especially in business. This is because their advertising platform allows you specifically target your audience, and to really niche down on their interests and behaviors without costing very much. When it comes to paid advertising, it goes beyond simply promoting posts. Take the time to sit down and really think about who your customer is to get your content in front of them. Write down everything know about them, from their age, job title, and interests to get a clear idea of who they are. Charlotte is amazed by the number of clients she works with who don’t know their audience. But there is nothing wrong with not knowing, so long as you acknowledge it so you can begin figuring out who they are. That then means they enter an exploratory phase where they can begin to test different content and targeting segments. It is a trial and error process. By needing you to be specific with Facebook Ads, it does give you a good reason to really look back at your brand to ensure you know it through and through, and who you actually want to target with your message. People often try and avoid figuring out who their audience are, preferring to focus on getting the sale, or because it is a difficult process which takes times. But by looking at it as a long-term strategy, it will ultimately prove more fruitful than ignoring it. Now you need to sit down and ask yourself what you want to achieve with your strategy, and how social media can support the way you already market business. Then you need to stay consistent. To help you out with this, Chipperfield Media have put together a free downloadable checklist which goes through the 11 pillars which are important to have in place. You’ll start to optimize your social media workflow and strategy, and it also includes recommended tools and best practices.